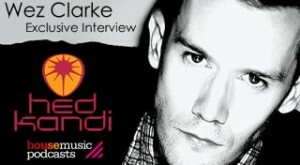 The team at House Music Podcasts were lucky enough to speak to Wez Clarke (Hed Kandi) and to ask him a few questions about her Dj Career! I actually started out producing when I was about 11 using a mixer and 2 tape decks. I then got hold of a pair of Memorex turntables and wired up pitch controls to them and taught myself to mix! I have no idea how I knew how to rewire a turntable at the age of 11 but there you go! Axel F by Harold Faltermeyer…..what a tune! I’ve been producing Booty Luv’s new album which is coming along nicely. I’ve also done remixes and production for Henry J Morgan, Lucien Foort, Rudenko, Marmaduke Duke, Platnum, Fedde Le Grande and a cheeky cover version of Jai Ho! Also touring the world with Hed Kandi each weekend causing trouble! Just basically by working hard producing music. It took a good 10 years before I got my first record deal and about 15 years before I saw any decent reward! What’s the best memory you have from behind the decks? Probably New Years Eve 05 at Gatecrasher playing Candi Staton “You’ve Got The Love” at Midnight while the confetti cannons were going wild! It was just one of those goosebump moments! I played at Space in Ibiza the other week for the first time too which was a total dream come true. Probably in Colombia…..I think I played for like 8 or 9 hours….they just don’t stop over there! Can’t think what it is that keeps them going! What’s your set up like at home? I actually don’t have a set up at home…I don’t even have a hifi! I have 2 studios in London Bridge though which both house Pro Tools rigs on Mac Pros. I’m getting back into Analog Synths so I have a lot of outboard gear and a Pro Tools desk. I don’t own any CDJ’s or Turntables which might seem weird seeing as I’m a DJ! What advice do you have for any up and coming DJs? I always say just be honest with yourself…..if you know you have what it takes, stick with it and eventually someone will notice your talent. If you know deep down you don’t have what it takes….think about doing something else. Would you agree that you have to produce tracks now to get a name? Yes 100%…..but they have to be good! What the largest venue you have played at this year? Who is your idle in the DJ world? What in your opinion does it take to be a world class DJ? Total dedication! Be prepared to have absolutely no life outside of work. It’s not for everybody. What format do you use Cdj’s or Vinyl? Also why? I use CD’s. I don’t really wanna have the hassle of setting up a laptop everywhere I go. USB sticks will be my next move once the 1000′s have that option. I don’t use vinyl for 2 reasons…mainly its too heavy….also I do edits of every track I play which would mean cutting a lot of dub plates! Who would you most like to play back 2 back with? What do you think of the house music scene in the UK at the moment? If I’m honest it’s suffering in the UK….not sure if it’s a money issue or if people are just bored of it all. The rest of the world still seems to embrace it enthusiastically. Where would you like to perform that you haven’t yet? In Your opinion who is the best DJ in the world? Tough question as I guess we’re all just spinning records. Technically I like James Zabeila and Sasha. The usual really. None of my best mates work in the industry so it’s good to just hang out with them and have a break from music once in a while. Have you entered the Top 100 Djs competition?